As a parent, you have taken the first step towards helping your child become a better athlete. You purchased all of the gear they will need and enrolled them in lessons. At this point you might be thinking your job is done, well you would be wrong. If you want your child to come out of this experience feeling good and loving the sport, or sports, then there is more for you to do! Below are a few tips for parents from USPTA Professional Leah Barnes. During a lesson, it is expected that the player will be focused on the skills being taught. They will be intently listening to the direction that the coach is providing and then trying their best to put that advice into action. 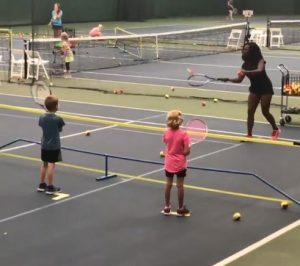 During this time the player and their coach are focused on the sport and are probably not paying much attention to the parent (who stayed to watch the lesson). However, the parent should pay attention to what is happening during the lesson. Does it look and sound like your child and the coach are having a good time? Can you tell what the goal of the lesson is? Is the coach working with your child on a particular skill? For instance, in tennis, they might be working on their stroke or footwork. By paying attention during the lesson, it will be easier to support your child’s growth in the sport. You will become more informed about their strengths and weaknesses, you will also be able to provide guidance outside of the lesson. With that said, it is important to remember that you aren’t the coach. Let the coach do the coaching and you focus on being the parent. Even though you aren’t out on the court or the field, as the parent you are a vital part of the team. If you play your position well, then your child will perform better, develop an appreciation for the sport and their confidence will increase as a result. Leah Barnes is a USPTA Professional at Wildwood Racquet Club in Fort Wayne, Indiana. She has been playing tennis since she was two years old and played #1 Singles for Canterbury High School where she went to State three of her four years. Leah has also been coaching children and adults for two years.